KY Haunted House in Eastview, Kentucky KY: Sinister Tombs donates its profits to local charities. 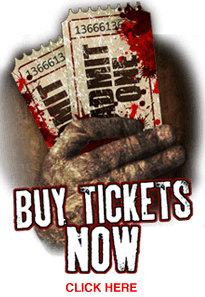 The Sinister Tombs Haunted House Old school haunted house with over 50 actors, wood trails cover bridges and a house you will never forget. This house entertains and scares with both skits and chainsaws. This is a MUST visit Haunted House in Kentucky! !Voted the scariest haunted house in Kentucky 2011 by visitors to hauntworld.com. Hauntworld advised Sinister Tombs Haunted House was their most viewed in 2014,15, and 2016. ABOUT "SINISTER TOMBS HAUNTED HOUSE"
KY Haunted House HIGHLIGHTS: Old school haunted house with over 50 actors, wood trails cover bridges and a house you will never forget. This house entertains and scares with both skits and chainsaws. You have to experiense to understand why we have such a following. Adults $15.00 Children 12 and under $12.00 Speed pass to the front of the line $35.00. November 2, and 3  - Starting at dark, or eight o'clock, the last ticket sold at 1 minute till midnight est. on our clock. We want you to come see us and enjoy the show, no weapons or alcohol allowed on Haunted House property, leave them in your car, please. I can't wait to visit this haunt, again, this year! This attraction has always impressed and amazed me! They add new rooms and switch up themes every single year! You never see the same show twice! Looking so forward, know why it's one of best. Have been going for years, each year they change so many things, went back 2 times last year and they changed the show between weeks, saw the owner and ask why he advised would be ready to open the day they closed. He seems to always want his show to improve, I like that way of thinking. This haunted house features both an acting portion and a more "jump scare" portion, blending to create a fulfilled experience when going through. The actors maintained an air of professionalism and stayed in character, even when encountered with interruptions. Our group took over an hour to get through, which is one of the longest experiences we've ever had. Can't wait to go back next year. Better every year, see why rated top Kentucky haunted house. I took a group down to Sinister Tombs Friday night and was amazed, this year they added so many new things. The acting was the best yet, the doctors were great, one was spanking the other, the one being spanked was shouting( it's not that kind of show) we were laughing so hard we cried, the outside was super scary with fog everywhere, and your walking through corn and it touches you its so close, they have a swamp that is the best thing I had ever seen until the tunnel. you just got to go. I love going here. The inside of the house is entertaining and the woods is even better. 10 out of 10, definitely recommend!! This is the best haunted house ever!!! Never go anywhere else!!! Its the best haunted house ever!! We took a walk through last week with the owner before coming to Transworld, he was super and the show was fantastic. Advised him we would bring group to his haunt when were not open in November. They work for charity and I met one of the groups they give to while I was their a dog search group, this place is great!!!!!! Go Lord Sinister.